Tomas Alfredson directed one of the finest vampire films of all time--Let The Right One In. After that, I expected great things. Let us get one thing out of the way right now--he did not disappoint. It helps that he chose a truly stellar cast with which to bring John Le Carre's spy drama to the screen. Many of you may have seen the BBC miniseries starring Sir Alec Guiness. Those who have not, should! But don't forget to watch this version as well. 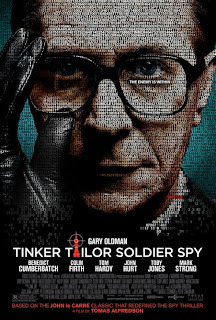 And let yourself be amazed, particularly by Gary Oldman as the anti-James Bond. George Smiley, rather than a dashing womanizer excellent at all form of death and mayhem, is a calm professor type, a detective of sorts who sifts through all the tedious details to find the treasure. Rather than good with women, George has an extremely troubled marriage--yet one can see in Oldman's eyes how much he genuinely loves her, and how in giving himself to that vulnerability he ends up hurt. Yet it is also what makes him worthy of victory. Not his the courage of the man who doesn't give a damn. Quite the opposite! All this emerges as part of an intricate web, one distilled from a fairly heft novel into two hours with considerable skill and success. Not a movement ends up wasted. Every detail matters, and we quickly learn that lesson. One of my favorite little bits from early on is when George is in a car with two other men, and a bee. They try to swat the bee away. George, he just watches it. Then, as it gets near the window, he opens that window to let it go. At the time, I was most impressed with his calm intelligence. Later, I recognized a man fundamentally good--and like any such man in a trade that consists of deceit and manipulation, conflicted by it all. Yet...brilliant. Later in the film he has to lie to someone, a lie utterly necessary, in some ways kind, but also ruthless. We could see him bleed a little bit in telling that lie. But he did it. The details. I cannot emphasize not only how important they are in this tale, but how skillfully we are drawn to notice them! At a certain point I found myself noticing a man's tie. The color. The pattern. Turned out there was a clue in there. Likewise, simple action of train tracks shifting intercut with Gary Oldman's face told us so much! Bravo! Essentially, the story (set in the 1970s, right in the heart of the Cold War) tells of an investigation of a "mole" or double agent somewhere at the top of British Intelligence, aka The Circus (its hq is in Piccadilly Circus). The title refers to codenames given the suspects, based on an old nursery rhyme: Tinker, tailor, soldier, sailor, rich man, poor man, beggarman, thief. Suspicion of such a thing is dismissed as absurd fantasy. But then a bit of evidence brings former Deputy Director of the Circus George Smiley out of forced retirement. He's given a mission by those above and outside the Circus--find the truth. And he does, knowing one of four men must be a traitor. One of them is now the head of the service. Another once had an affair with George's wife. Many and sad are the betrayals in this story. Wonderful and fascinating are George Smiley's efforts to learn the truth, among other things by letting people lie to him then spotting it. All the while, lurking deep in the background, is the legendary Soviet Spymaster known as Karla--a brilliant fanatic whom George met once, many years ago. The miniseries was more subtle in some ways, but the film comes across as clearer. Beneath the surface of all this remains the beating of human hearts, and therein lies the tragedy of it all. The power. And in a way a little weakness. I wasn't surprised upon learning the identity of the traitor. Then again, I already knew. But really, who else could it have been? Along those lines, I will say the magnificent Ciaran Hinds was criminally underused. Which happens sometimes with a really fine actor ends up in a supporting role. Same thing happened to him in Harry Potter and the Deathly Hallows. Benedict Cumberbatch does an excellent job in a meatier role, elevated to rather more than he is in the book, a tragic figure in his own right. In fact, that brings up what makes TTSS so effective and so different from stuff like Mission Impossible or the Bourne movies. People in this film cry. They have reason to. And some of them weep without shedding a single tear. Some folks will mutter about "nothing happens" or won't follow be able to follow the story. Their loss, really. I predict plenty of Oscar buzz for this film. Among other things I feel greater and greater excitement at seeing more of Alfredson's work.